One thing I miss about NYC is a REAL screening. Screenings there are primarily press. Here in Chicago, the screenings are opened up to the public, where you not only contend with 2,000 anxious people just hoping to get in, but there is a good chance you’ll be sitting next to someone who says, “Ooooh, girl! I’m scared already!” then continues to chat throughout the film. And if I hadn’t already suffered enough by seeing Annabelle, Hollywood rubbed salt in my still fresh wound with Ouija. Fast forward to Debbie, now in high school, throwing a spirit board into the fire and looking scared because she broke the rules. Debbie thinks she’s now safe, but, naturally, doors open on their own, the stove turns on by itself, and then, when Debbie goes to her room, the board is on her bed. *gasp* She in turn does a swan dive off the balcony, using a twinkle light noose. I hate the name Debbie. Laine, played by this generation’s newest horror darling, Olivia Cooke, is devastated by her friend’s death and talks their clique into using the board to communicate with her and say a final good bye because grieving wasn’t an option. In a surprise twist (no it wasn’t), they contact someone else and the disposable teens start dropping like flies. One thing I will give Ouija, even though the cast is about as exciting as a bowl of oatmeal, they are more or less passable as normal high school students. College sophomores would have been more accurate, but what can you do? I like Olivia Cooke. I think she’s great on Bates Motel, but girl needs to branch out a little. Even she isn’t worth watching in this. If only it were that easy to shut up teenagers. 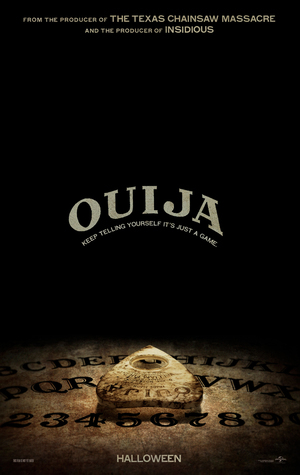 Ouija is full of subplots that go nowhere and poor misdirection, which serves only to confuse rather than frighten. You will certainly get your fill of jump scares, which are poorly executed, save a couple. I think she works at the local Starbucks. There were a lot of little things that really angered me. When Debbie’s parents decide they need some time away from the house their daughter died in, they leave it in the care of Laine, a grieving teen. During the first séance, the lights go out, as expected, but no one heads for the breaker box to turn them back on. In repeated visits to the house for one thing or another, they just scramble around with flashlights rather than turn on the lights. One by one, as the kids meet their demise, there seems to be no speculation of foul play. They just died and everyone seems to be ok with that. Lin Shaye makes an obligatory appearance as a former resident of Debbie’s house and tells a story far more compelling than anything else in the movie. (Prequel greenlit in 3, 2…) Also be on the lookout for a brief appearance by Robyn Lively (Teen Witch). She isn’t in the film for more than 2 minutes, but it’s nice to see she’s still working and looks stunning. Admittedly, and not surprisingly, I went into this with bargain basement expectations and they were met in spades. For crying out loud, all you need to see is “From the producer of The Texas Chainsaw Massacre and the producer of Insidious” to know there won’t be one moment of real terror. What’s next? Hellraiser Monopoly? Candyman Land? Connect Four Horsemen of the Apocalypse? Actually, I’d probably watch any of these.